So this year for my Gram's birthday, I made a few things she can keep down at her Summer home. This is the place that everyone in the family spends time at - and sometimes forgets who has made it possible for us to relax and have a less costly vacation... 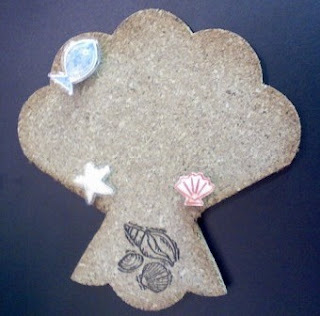 I found cork magnets at JoAnn's for about $1, and cut it to look like a fan shell.. .then made some push pins for the cork, to display on the fridge. We put coupons, phone numbers, or grocery lists up there and only have about 3 magnets to keep them all in place... well my folks- that is all about to change!!!! I mean afterall, I have to come up with something for Christmas. Thanks for looking! - Have a great weekend!